Mark De La Rosa returns to the Octagon for his third UFC bout on Saturday, Nov. 10 but it’s his wife, Montana, predicting Fight of the Night. While it may be expected that somebody would possess high praise for their spouse or significant other, what isn’t to be expected is that the spouse to also possess the knowledge and the skill to also compete at the highest level. With a 9-4 professional MMA record and a 2-0 record in the UFC, Montana De La Rosa has just that. 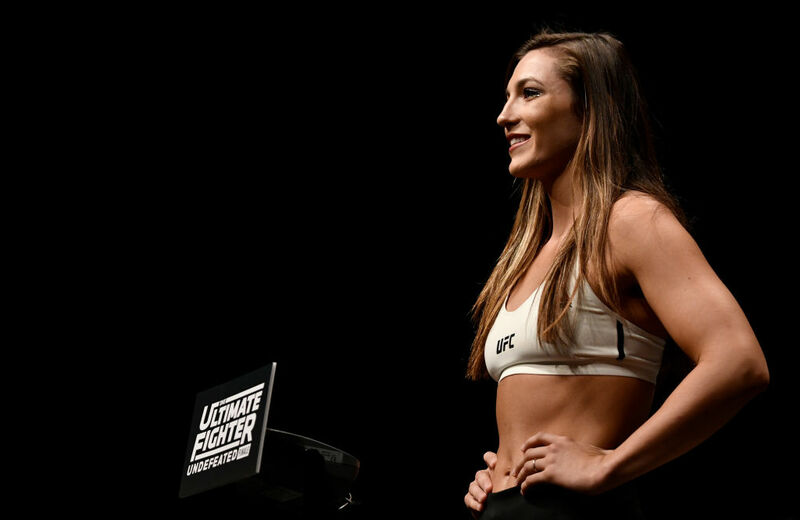 The UFC’s first married couple met five years ago while training at Genesis Jiu Jitsu and married just before Montana De La Rosa’s UFC debut at The Ultimate Fighter Season 26 Finale on Dec. 1, 2017. Now in the UFC, Montana knows that ground has been broken as the first married couple in company history, but isn’t surprised. Montana explains that with both of them specializing in grappling, the two have put themselves in a good situation to win, as both have done, but to continue improving every day whether at the gym or at home. Much to her surprise, De La Rosa also explains that martial arts and fighting has yet to wear on the couple’s personal life. It was fighting that introduced the couple, now it has become their careers and with a dream of a simultaneous title reign and a healthy retirement by 35, De La Rosa still gets nervous knowing every opponent has the potential to cause serious injury to her husband but thanks her training and MMA IQ for not stressing as much as other couples might. With just under a year of UFC experience under their belt, De La Rosa’s dream is in the building process and the couple is making strides with every win. The next step, however, is Joby Sanchez. A versatile 27-year-old with a record of 11-3 with wins spread out in each category. Four wins by KO or TKO, four wins by submission and three wins by decision. Although it’s proven that Sanchez has done everything in his power to win, De La Rosa explains that despite a large majority of her husband’s wins coming by submission, six as opposed to the one TKO and three by decision, Mark’s advantages of Sanchez prove that he may not have to. With the high hopes in mind for De La Rosa and her husband, she understands the grind for everybody in the company but will live out her dream by any means necessary. Although De La Rosa doesn’t have a fight of her own on the card tune in as Mark takes on Sanchez in the Early Prelims kicking off at 6:30 ET only on UFC FIGHT PASS.